Sceptre TV Review 2019: Can Cheap Be Good? It will only be a matter of time now before the kings of electronic entertainment hardware really start to have to compete with the underdogs of this era. 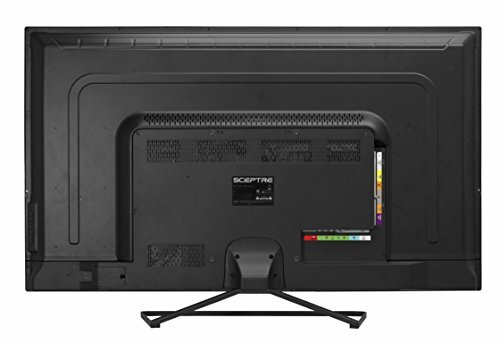 This will be made more and more clear as you venture through our Sceptre TV review. With the dawn of 4K resolution and Smart TV functionality, older titans like Sony and Samsung have had extremely worthy competition. And one of those names putting their skin in the game is Sceptre. Many people these days may still think it best to stick to the well-established name brands when it comes to television shopping. But the fact is that high-quality TVs are even easier to find than ever before, regardless of price range or manufacturer. The most state of the art products are simply becoming more and more affordable, too. We may very well be living in the golden age of television production. Sceptre may be one of the brands leading that charge. Recognizing this, we decided to look at 5 Sceptre models to compare and contrast. 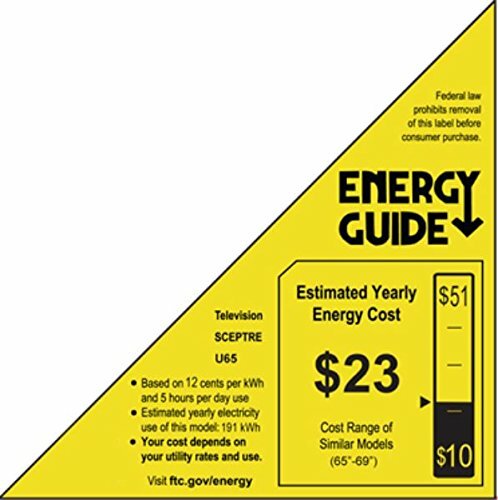 These Sceptre TV reviews will be less of a top 1 to 5 ranking list and more of a tailored recommendation based on your particular needs. Not everyone wants the exact same kind of television, which is why each company makes so many different models. Note: None of the models in the Sceptre TV review are smart TVs. These are 4K and 1080p standard sets only. 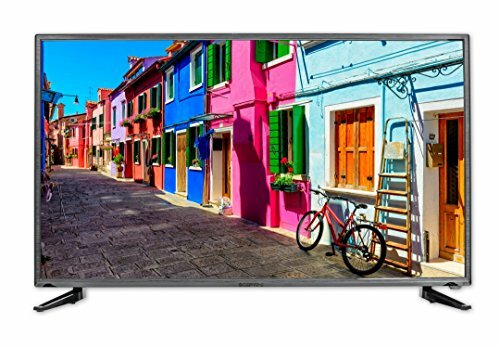 This makes them excellent budget-friendly TVs for use with Android TV boxes or IPTV set-top boxes. Ultra High Resolution 3840 x 2160; Ultra Slim Design. The 4K TV Box is designed for U500 series. The U508CV kicks off our Sceptre TV reviews because it fits the ever-growing list of criteria more and more people are demanding from their television set. A 49-inch screen is not the biggest but it is surely going to be large enough for most people. It sports three HDMI ports, which is the standard amount, perfect for a DVD or Blu Ray player, a gaming console and a streaming box to be plugged into all at once. All ports are located on the left-hand side of the back of the television for easier access, making cable management simpler and more convenient. TV stands are often a hit or miss issue with television sets in the 50 inch or higher range. Typically they are adequate but the double legged set-up that is most common these days is prone to be flimsier on certain shelves or cabinets. The U508CV goes for one larger stand that sits in the center of the model’s base, and frankly, it works quite well. This model only weighs 22 pounds, which is lighter than average. The U508CV doesn’t have the slimmest body or screen frame yet somehow it’s easy to pick up and adjust. All those basic features sound nice and all, but the real reason you wanted a Sceptre TV review was for the picture quality. Maybe even some notes on the sound quality too. And both aren’t the best there is, but they’re certainly not bad for the price range. The factory default sound settings are quite bland and flat, but messing with the menu equalizer can fix that to make it adequate. And this is a 4K TV set we’re talking about, so we would all expect some level of high detail and quality. You’ll certainly see a difference if this is your first 4K set and are on a budget, and that appears to be the market that Sceptre is aiming this model at. The U508CV doesn’t portray darkness and light in the most realistic fashion. Nor does it have the most vibrant looking color settings. This screen also has some issues with glare and viewing angles, especially when in the range of window light. But it is still a 4K screen, meaning that if you have the right content to use with this, you will get some incredible results. It also has a decent upscaler, meaning it “translates” 1080p onto this screen quite well. We’d wager that 1080p will look better on this screen than most dedicated 1080p TV sets, as is becoming increasingly common these days. It’s not the best, but it will surely be a great entry level 4K screen for anyone looking for a quick and cheap upgrade. Sceptre knew this was a heavy demographic in the TV marketplace, and the U508CV suits that audience nicely. The U550CV is quite similar to the previous model, with some important and some not so important differences. The biggest one, of course, is that this model is 55 inches instead of 49. That may not seem like a lot, but that measurement refers to diagonal length only. In terms of actual surface area this screen is actually about 30% larger. That really makes a difference depending on where you plan to store this screen, and with regard to pixel density. Pixel density essentially refers to how large the pixels will be. You always want to have smaller pixels, but more of them. This creates images that are as crystal clear as possible. 1080p is roughly 2 million pixels and 4K is 8 million. So on a 55 inch screen, 1080p pixels will look about 4 times bigger than 4K resolution on the same screen size. Bigger pixels always lead to a blurrier image. For reference, imagine zooming in on a computer jpeg image to the point where you can see the tiny squares that make them up. Or you can simply shift your face closer to your computer screen right now. The lines that divide both horizontally and vertically make up the pixels, and it is a good television’s job to make those lines seem invisible. 4K has a lot more pixels than 1080p, and larger screens that are in the 50 inch + range are generally viewed from a couple feet or meters away due to their size. This is why this range is considered the sweet spot for 4K. 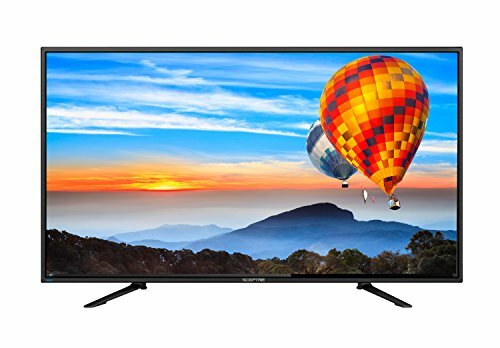 So you must be thinking: is 55 inches better than 49 inches for 4K? Our answer is probably. Some TV nuts out there are really picky about their pixel density, even at ultra-HD. But we think screen size is just as important too, and an extra 30% surface area is nothing to scoff at. The U550CV even comes with four HDMI ports instead of only three. It may be much heavier, weighing over 40 pounds, but the two base legs were cleverly designed. They are widely angled facing towards the outside of the frame and are longer than most legs, so it’s sturdier than it looks. This is basically the older brother of the U508CV, and we recommend this model for those who are willing to spend a bit more for a larger screen. 65 inches is by far the biggest TV screen in our Sceptre TV review. 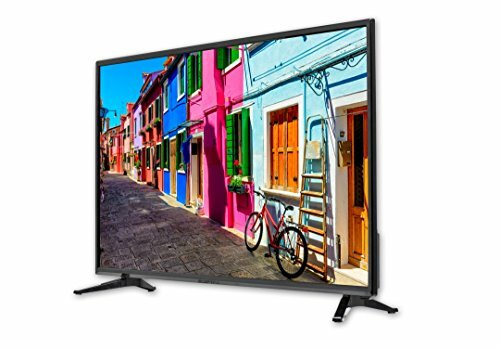 The U658CV is perfect for those looking for a wall-mounted television. Make no mistake, 65 inches is very, very big. Make sure to only go for a screen this size if you have space, be that on your wall or on a spacious enough table. 65 inches is roughly another 30% bigger than a 55-inch screen, which effectively makes this a perfect size for anyone looking for a true home theater experience. You may be worrying about pixel density after our previous section but have no worries. 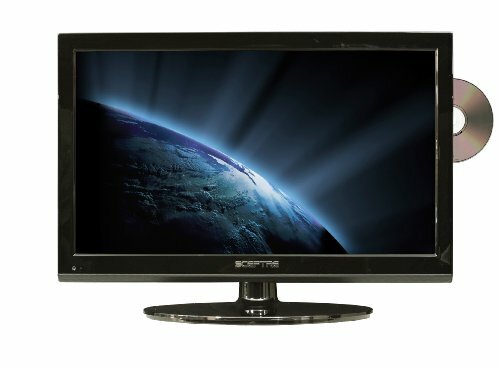 This size is still very effective with 4K resolution, and Sceptre continues to provide their trustworthy upscale technology in this model. You could even view DVDs in 480p or play older games in 720p and they will still scale very nicely on this screen. One may be intimidated by the assumed weight of the U658CV when it comes to installation but it only weighs about 45 pounds, which is quite decent. If you’ve never installed a wall-mounted television before, especially one of this size, you may want another pair of hands to help you. But in the end, its a fairly simple and painless procedure. The most disappointing feature about this television, like many of them, is the sound. Television speakers are rarely going to be as high quality as dedicated speakers or even HD headphones. If you’re a real home theater enthusiast then you probably already have a soundbar, a surround sound system, or something prepared to give you the 4K equivalent of fidelity audio. Otherwise, the speakers may underwhelm you for being unable to keep up with the power of this screen. 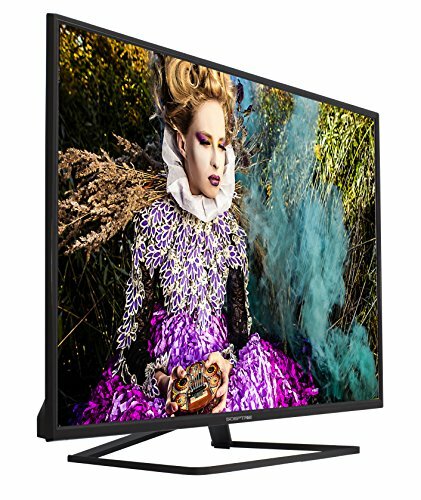 The last two models on our Sceptre TV reviews list are not going to be 4K. They are the classic 1080p resolution models. The fact of the matter is that not everyone is ready to make the jump to 4K. Ultra High Definition resolution as it’s also known as isn’t available everywhere. Only some video games, blu ray movies, Netlflix and Youtube offerings come in 4K. Some people don’t even think the quality is worth the hype and claim they can’t even tell the difference. That’s why 1080p screens are still selling. Going by the metrics on Youtube and broadcast television, 1080p is still the common standard. 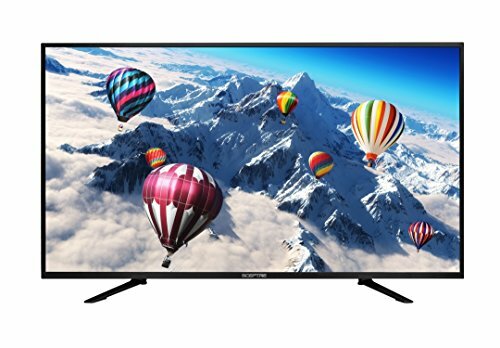 The E243BD is the kind of TV you want for a computer desk. It’s a small screen and is roughly the same size as your typical computer monitor. It’s the perfect secondary or auxiliary device to have in the kitchen when you’re cooking, in the garage next to your workshop or any similar scenario. 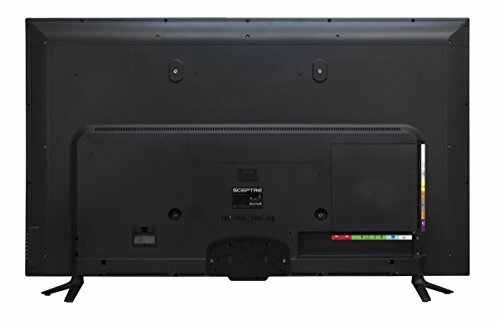 It’s also great for small apartments or dorm rooms where one can’t fit a giant 60-inch screen. Its convenience is maximized by the built-in DVD player. The disc slot rests on the side and requires no external player to be connected, leaving you three HDMI slots for other purposes like an Amazon Fire TV box or a gaming console. It can also be used as a computer monitor and is even wall mountable. It doesn’t have the greatest colors or the greatest speakers, even by TV standards. So this is a purchase for those living in cramped spaces or for those simply wanting an extra screen outside of the main living room. The final model on our list is arguably the most unique one we have to offer. The E415BD is a full-size screen with a built-in DVD player, something you really don’t see every day. 40 inches obviously isn’t very portable but this is a decently sized monitor for 1080p. 50 inches and up starts to really stretch the pixel density of 1080p. It has much better speakers than the E243BD, but doesn’t quite have the quality or the upscaling power of the first models on our list. But this is still a great choice for anyone looking for an affordable 1080p screen that offers a lot of value for its price. It’s also perfect for anyone who was also already shopping for a DVD player. Since it has one built in it saves you a few dozen dollars at least. One gripe to note about this model is that the ports and the DVD slot are located in the center of the frame rather than at the edges, making access to them a little harder. You’ll need to stretch every time you want to plug or unplug cables or switch out discs, so beware if you’re setting this up in a tighter than usual space, or even for wall mounting. 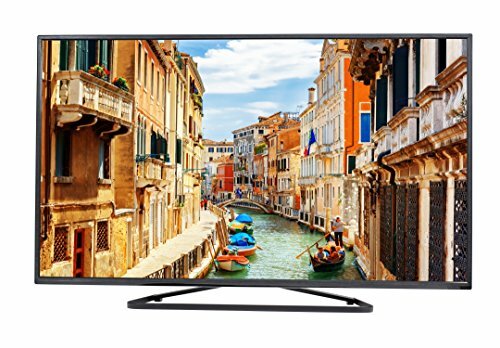 Combined with thick and sturdy legs, easy to access buttons, solid color saturation and even the added bonus of giving you batteries with your remote control, this is a perfect buy for those in the market for a reliable TV meant to play the basics: streaming content, DVDs, gaming and the like. With three 4K screens and two 1080p models, we hope our Sceptre TV review helped you understand the diversity of considerations that go into selecting a model that is optimized for your preferences. Different people will want different sizes, resolutions, and functions. Not every TV can accomplish everything desired all at once or meet every demand. We also hope you realize that not every TV needs to be a Smart TV in order to be a smart purchase. Chances are you want a dedicated streaming box that is much better optimized for streaming services anyway. Don’t fret too hard over making your decision, chances are you’ll be happy with your purchase no matter which one of these quality screens you choose.